Manorama Kotnis, the 93-year-old younger sister of an old friend of the Chinese people, the late Dr Dwarkanath Kotnis, traveled from Mumbai to New Delhi to meet visiting President Xi Jinping on Friday. Seated in her wheelchair, she tightly grabbed the president's hand as he presented a friendship award to prominent contributors of cultural ties between China and India. Kotnis' brother came to China in 1938 to render medical assistance when China fought against the Japanese invasion. He died in China in 1942. His sister said that her family is deeply touched by the fact that the Chinese government has not forgotten her brother, and they will try to carry on his efforts to forge a friendship between the two countries. "Handing down the legacy of China-India friendship is a great and solemn pursuit, and it is in the interests of the current and future generations," Xi said. The president spoke of the deeds of people such as Kotnis and the Indian poet Rabindranath Tagore. "Their firm pursuits and unselfish contribution to friendship between peoples are admirable," Xi said. 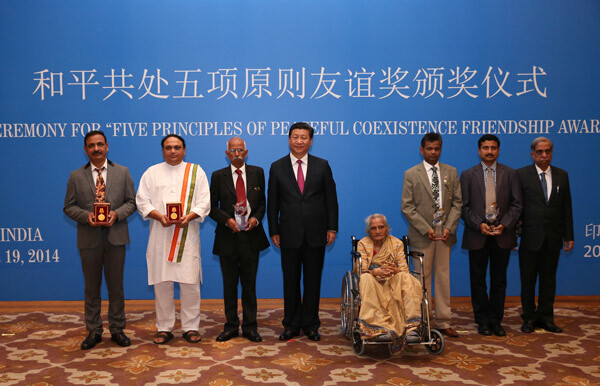 At the gathering, Xi presented the Friendship Award of Five Principles of Peaceful Coexistence and congratulated the first group of awardees. The principles, first proposed in 1953 and officially approved in 1954, are a political consensus and shared wisdom reached by the older generation of leaders in China, India and Myanmar. Xi said the principles have become an important code of conduct in international relations, and the award was designed to pass on the legacy of building a new type of international relations that advocate equality, mutual trust, inclusiveness and cooperation. Avijit Banerjee, head of the department of Chinese language and culture at Visva Bharati University and a representative of the awardees, said he appreciated the award and expressed a willingness to further the friendship. Jiang Jingkui, director of the Center of South Asian Studies at Peking University, said that given the shared cultural agenda, "the understanding between the two countries is still far from enough". To boost exchanges, China will provide 10,000 scholarships to South Asian countries and help cultivate 5,000 Chinese-language teachers. Xi praises contributors to China-India friendship during his trip to the southern Asian country.